Several members of the club and myself went to the open house for Schell Games on the evening of May 17th. This was the second open house I had been to at the studio, the first being last October. This visit though, I was able to talk more with their employees and ask more questions about production schedules, budgets, etc. Schell Games is an interesting company, in that they just turned 13 years old and they grew from a five person team to around 120 employees. They have a good mix it appears of client work and personal intellectual property that they push. Many other game studios in the industry hire employees for specific projects and fire them as soon as they are over. However, Schell Games is one of those developers that has enough work lined up so that after a team is finished, they just move onto the next project next week. At the end, we were able to get a picture with Jesse Schell (Head of the Studio and author of “The Art of Game Design: A Book of Lenses” (which I used in my game design class at WVU)) and talk with him briefly and thank him for hosting the open house. It was a great night and I’m glad our group was able to attend. I have been working on a new project for the past few months and it is called Cheese. I don’t want to share many details about it, as I want the game and the experience to be a surprise to the players, but the purpose of this post is to confirm that it is a real thing and that I am currently developing it in whatever spare time I can find. You heard it here first. So I have been playing a lot of Nintendo Switch lately and wanted to make a post about my opinions on the device. Growing up, I played a lot of Nintendo. The first home console me and my brother got was a Gamecube, we were hyped when we got a Wii when it launched in 2006, and naturally purchased the Wii U when it launched in 2012. Now later on, I played more Xbox and PlayStation as those games kept my interest more at the time and the Wii U really turned me away from Nintendo for several reasons. So when I heard the rumors about the Switch (they talked about a hybrid console several months before the launch trailer) I wasn’t holding my breath, I just wanted to see what they announced. After I saw that first trailer, I was a bit skeptical but I was excited about the announcement. I have always personally liked gaming more on consoles than handhelds for several reasons, mainly because the screen is bigger and generally the console games I thought had deeper gaming experiences. The combination allowed me to get more immersed in those games (and the better graphics on consoles helped that as well). So when it came up to launch time in March, I was hugely on the fence. There was a ton of launch hype for the thing and I knew several people looking everywhere to find Switches. I have played almost every Zelda game in the series as well, so I was also very excited for Breath of the Wild and since I didn’t have a Wii U, it made the Switch a more appealing purchase. So I ended up getting one, what can I say? I am very happy that I got a Switch this early. Breath of the Wild is an amazing game and even though I haven’t gotten as far as about everyone else I know, I can’t wait to sit down and play it some more when I have the time. While I do have some complaints about the game, being open world is amazing and this game makes me really excited about the potential future of the franchise. (One of my favorite parts of the Zelda games were the dungeons, so those being scaled back was kind of a bummer for me but in no way does that make this a terrible game). Considering that, I still don’t know if it deserves all this crazy credit it is getting from people. It’s definitely a step up from some of the most recent installments, so again I am looking forward to seeing more innovative game design used in the series going forward. Outside of Zelda, another thing I really like about the device is playing it when I am out and about. Showing it to others that don’t follow the games industry that closely and getting them to play it got them very excited, and just seeing their amazement when I snapped off the joycons was thrilling to me. Snipperclips and Fast RMX are also great games to jump into and show off some of the Switch’s features to them. Both were worth the purchase in my mind. There are several things that Nintendo has done with the Switch that I don’t agree with as well, so I am going to cover them here. I do not agree with the price of 1 2 Switch. While I understand why they couldn’t package it in with the console, they could have at least brought that price down a bit. Also the eshop felt very empty at launch. While I know online has always been a weak point for Nintendo, I think they could step up their game a bit for that. But back to positives, their lack of region locking is great. I made a Japanese Nintendo account on the day I got the Switch, since it allowed me to download demos that have not been released in the North American store, including Puyo Puyo Tetris and this cave exploring side-scrolling game. While I didn’t understand anything they were saying, I think part of the fun of those is guessing what to do and figuring it out was really satisfying for sure. Mario Kart 8 Deluxe just came out very recently and that game is great as well. I have not bought a new Mario Kart game since probably the DS or Wii, so being able to experience the thrill of that at the game’s launch was great for me. I have been really enjoying the new courses, as well as the familiarity of the retro courses which I instantly recognized for the most part. So in closing, I am very happy with my Switch purchase. Would I recommend others buy it? Yes I would. Even if you don’t like Zelda or Mario Kart, their are some great games coming in the next few months, we are going to have some great E3 announcements soon I am sure, and the larger the install base gets for the Switch, the more likely that third party developers will develop games for it. So do us all a favor and go out and buy a Switch! Below is the last email I sent out to the club list – I mean everything I said in this email. I’m glad I had the honor of leading the club the past two years, just recording this here for historical purposes. It has been my honor to serve as your President the last two years. It’s exciting to look back and truly see how far we have come as a club. As I stated at the student showcase, we have achieved many great things. We have become an official IGDA student chapter, connecting us in the past year to many other universities with similar clubs. We have been a host site for the Global Game Jam, the largest game jam in the world. A group of us got to travel to Texas last fall to participate in Chillenium, the largest student game jam. We have had countless club game jams in between those. We have had game developers and alumni come to speak or Skype in, to give their advice to us on various topics. We have raised over $2,000 for Extra Life, which went directly to help the WVU Medicine Childrens hospital! We built our own tabletop arcade cabinet using a Raspberry Pi and programmed our own games for it! All of our success would not be possible without everyone’s individual support of this club! So thank you all for the last two years! I want to especially thank all of my officers the past two years who have helped make us a success as well – Kati Baker, Destiny Dunn, Veronica Blackshire, Ryan Kubik, Connor Haynes, and Ahmed Mian. I have full faith in the newly elected administration led by Tristan Snyder and I wish them the best of luck this coming year. Don’t be a stranger, you all are welcome to reach out to me anytime! Follow me on Twitter @JordanHallow or add me on LinkedIn to stay connected! I wish you all success in all your future careers and game development projects! One of my ideas when the club started was that we have an event where the club can have setups of playable games for anyone interested at the university to play, similar to how other universities that have gaming programs require theirs students to show their projects. I also thought it could be similar to the Computer Science senior design project fairs I have seen in past semesters here on campus. Our club is really lucky to meet in the Reed College of Media Innovation Center. It has a lot going for it, being in one of the newest buildings on campus, it is located right next to the Evansdale PRT station and it has some great tech. They have screens in about every room there that can be connected to wirelessly with their software on anyone’s laptop or via HDMI connection. On top of that, they have four media carts with both of those connection options, which finally made this showcase idea a viable and doable event for us. So we were able to set up five live games through connected laptops that each game’s developers brought to run their game on. They all used the HDMI since we wanted the input to not have any delays that the wireless would sometimes get. The actual event was two hours and split in half, with the first hour being club reflections, individual game presentations from club members that wanted to talk about their games to everyone in attendance, and club awards. In the second hour, we had the stations set up where attendees could play the individual games that we had setup. 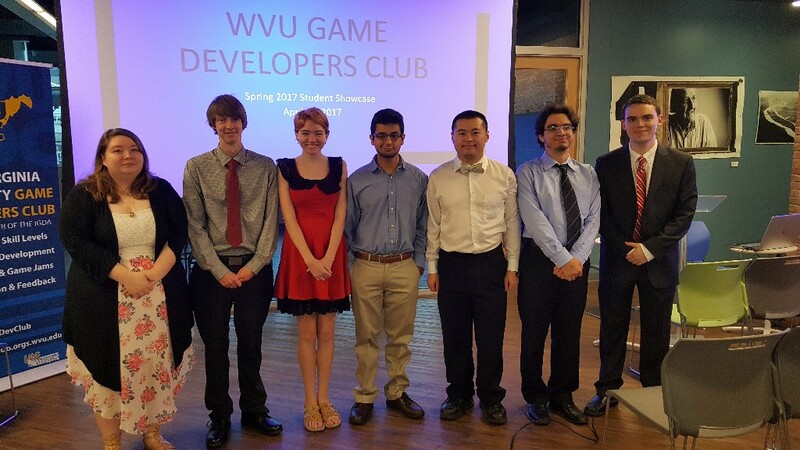 We gave club influencer awards to several WVU staff members that helped our club in the past year with our various events including the Global Game Jam and Unity Workshops. Overall, everyone in attendance enjoyed themselves and everyone that wasn’t part of the club I think enjoyed talking to the individual teams about their games, in addition to playing them. We filmed most of the event and I will be linking to that YouTube playlist once it is made below. I got my essay published about the creation of the WVU Game Developers Club in “Life-Changing Student Organizations” and it is on Amazon!! You can check it out here. I attached a description about the book below. Life-Changing Student Organizations is intended to give university students an inside look at the many unique opportunities that are currently available to them at their given college or institution. It also gives high school students a view behind the veil at what it’s like to live an active university life. From Quidditch to rugby, religious groups to Greek Life, woodworking to video game design, and much in between, Life-Changing Student Organizations contains something for people of all interests. Comprised of over forty essays—contributed entirely by current and former leaders of major student organizations from five separate Division 1 universities—the book is a kaleidoscope of distinct voices, beliefs, and backgrounds. All, however, seem to arrive at the same conclusion: With a little on-campus initiative, anything is possible.